This package includes Pearson MyLab Economics. International Trade: Theory and Policy provides engaging, balanced coverage of the key concepts and practical applications of the discipline. An intuitive introduction to trade theory is followed by detailed coverage of policy applications. 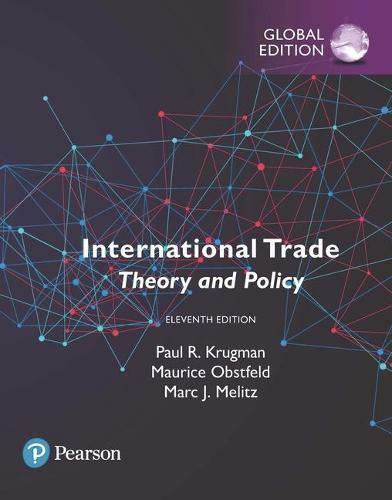 With this new 11th Edition, the author team of Nobel Prize-winning economist Paul Krugman, renowned researcher Maurice Obstfeld, and Marc Melitz of Harvard University continues to set the standard for International Economics courses. This package includes Pearson MyLabTM Economics, an online homework, tutorial, and assessment program designed to work with this text to personalize learning and improve results. With a wide range of interactive, engaging, and assignable activities, students are encouraged to actively learn and retain tough course concepts. MyLab should only be purchased when required by an instructor. Please be sure you have the correct ISBN and Course ID. Instructors, contact your Pearson rep for more information.